SHENZHEN: Chefs may shortly be bidding farewell to the kitchen thanks to the invention of a cooking robot, able to conjure up the tastiest traditional recipes in a couple of minutes. Named AIC, an abbreviation for Artificial Intelligent Cooking, the robot is the world's first machine that can complete all the cooking skills used by Chinese chefs, producing delicious dishes, said inventor Liu Xinyu. "Most Chinese families spend some 2 hours a day cooking lunches and dinners. Why not save the time for more meaningful activities and meanwhile enjoy the same delicious dishes produced by automatic machines in a cleaner environment?" Liu said, explaining his initial idea to China Daily. However, it took him and several scientific institutes four years and roughly 20 million yuan (US$2.5 million) to create the successful sample robot, which made its debut on the eighth China High-Tech Fair that opened on October 12 and ends today. As well as the scientists, who have been standardizing every motion a chef makes and turning them into a computerized language, several of China's top chefs are also participating in the project, contributing recipes and cooking methods. At the demonstration at the high-tech fair, a demonstartor opened AIC's door, which is shaped like a refrigerator's door, and put into a box of seasoned ingredients. He closed the door and selected "Kung Pao Chicken," a Sichuan dish with chicken cubes, peanuts and dried peppers, from the instrument panel. Four minutes later the dish was done and an attractive smell wafted out of the machine. Visitors tried the dish, many surprised by its vibrant taste. "It's really good the chicken is nice and tender," said Wei Zhengyuan, who is works for an online marking consultancy. And Liu said the robot would be even more skilled by the time his company, Pansum Technology, began marketing it. "The outlook of AIC needs improving and the performance should be further stabilized," he said. "Although theoretically speaking it could cook tens of thousands of dishes Chinese, Thai or western food AIC can only cook about 130 at the moment and needs more cooking methods inputted." He is currently looking for partners to help him manufacture AIC, produce ready-made ingredients for it called "Precise Meals" and market it. 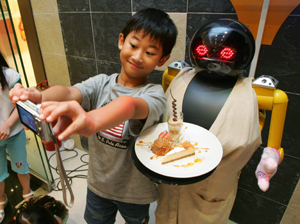 The robot is expected to be adopted by some restaurants and canteens, replacing some of the chefs, if not all, by the end of 2007, Liu said. Zhao Moming, a director of Pansum, said the company's final goal was to introduce the robot to the home. "We hope 1 per cent of the families in cities such as Beijing, Shanghai and Guangzhou, will use AICs by 2018," Zhao told China Daily. Lin Yongqing, who runs a Chinese fast-food chain in Shenzhen, said he is interested in the robot. "We will look at the costs first, both for the robot and the 'Precise Meals,' then decide whether we will use it," he said. But Li Guocheng, which runs two seafood restaurants in the city, said he prefers human chefs. "I would rather pay a 1 million yuan (US$126,583) annual salary to attract a top chef. I can't believe a robot could ever replace someone so skilled," said Li.